With a contemporary new look, a revised interior and more powerful and fuel-efficient engines, the redesigned 2014 Cadillac CTS looks like a serious contender in the midsize luxury sedan class. The 2014 Cadillac CTS has been fully redesigned. Highlights include bolder exterior styling, new base and high-performance engines and the adoption of Cadillac's latest electronics and touchscreen interface. Wide-ranging engine lineup delivers both fuel economy and performance; sophisticated exterior style; attractive interior design with high-quality materials. The midsize luxury sport sedan class is one of the most highly competitive segments, and this is where the redesigned 2014 Cadillac CTS must compete. All the big-name luxury automakers have a strong presence here. From the Audi A6 and BMW 5 Series to Jaguar XF and Mercedes-Benz E-Class, the bragging rights for the most sophisticated, the most enjoyable, the best performing or even the most handsome sedan on the road truly matter in this class. The previous Cadillac CTS was a good luxury sedan, but that wasn't enough to keep up with these European rivals. For its new CTS, Cadillac has revised just about everything, and the results are encouraging. The new sedan sits atop a 1.2-inch-longer wheelbase, and it's 4.2 inches longer overall and 0.8 inch lower. Thanks to this upsizing, the 2014 CTS is now a true midsize sedan -- an improvement over its predecessor, which was too big to feel as sporty as competitors' compact offerings but not nearly as roomy as traditional midsize entries. Styling is largely an evolution of the outgoing model; the restyled grille is simultaneously more slender and more aggressive, and the Caddy's new LED running lights are striking. Where the previous CTS sedan's styling looked forced and overly angular, the 2014 Cadillac CTS has a more flowing and elegant design. The 3.6-liter V6 returns with a few more horsepower, but now there's a new base engine for the CTS. Borrowing a page from its European competitors' playbooks, the new power plant consists of a sprightly turbocharged 2.0-liter four-cylinder that first debuted in Caddy's ATS sedan. There's also a new engine within a new trim level called Vsport. Meant as a range topper (not including the upcoming CTS-V sedan), the turbocharged 3.6-liter V6 generates similar power to the mighty turbocharged or supercharged V8s found in competing sedans. The high-performance Vsport model is only available with rear-wheel drive, while both the four-cylinder and naturally aspirated V6 models offer optional all-wheel drive. Inside, the CTS takes its lead from the XTS with rich leather and trim elements, a large configurable gauge-cluster display and a second color touchscreen display to operate the CUE infotainment system. Overall, there's a very luxurious vibe inside, though we hope Cadillac updates CUE's controls and haptic touch-sensitive virtual "buttons" for a more intuitive, tactile feel and quicker response. Our experience with CUE in other Cadillacs has thus far been underwhelming. While our time behind the wheel has been limited thus far to the high-performing CTS Vsport model, we can confirm that Cadillac is taking the fight to premium-brand import competitors in this price range. The 2014 Cadillac CTS sedan's equipment levels and interior materials are equal to or better than those seen in the 2014 BMW 5 Series or 2014 Mercedes-Benz E-Class. Furthermore, the new powertrain lineup is as sophisticated and modern as anything currently available in the midsize sport-luxury segment. The bottom line is that for the first time in a long time, Cadillac appears to have a complete package without the compromises we've seen in earlier models. When dealers begin offering test-drives of the 2014 Cadillac CTS, you owe it to yourself to take more than a spin around the block. The 2014 Cadillac CTS midsize sedan is offered in six main trim levels: Standard, Luxury, Performance, Premium, Vsport and Vsport Premium. Engine availability -- a turbocharged 2.0-liter four-cylinder, a 3.6-liter V6 and a turbocharged V6 -- is dependent on the particular trim level. The 2014 CTS coupe and wagon, as well as the CTS-V, are carry-over from 2013 and are covered in separate reviews. Equipment on the CTS Standard trim (four-cylinder only) includes 17-inch alloy wheels, Brembo-branded brakes, heated mirrors, automatic headlights, rear parking sensors, remote ignition, keyless ignition/entry, an auto-dimming rearview mirror, dual-zone automatic climate control, a manual tilt-and-telescoping leather-wrapped steering wheel, a 5.7-inch display screen in the gauge cluster, eight-way power front seats (with two-way power lumbar), driver memory settings, leatherette (premium vinyl) upholstery and fixed rear seats with a trunk pass-through. Electronic equipment includes OnStar telematics, Bluetooth phone and audio connectivity, the base Cadillac User Experience (CUE) infotainment system, an 8-inch touchscreen display, voice commands and an 11-speaker Bose surround-sound audio system with three USB ports, an auxiliary audio jack, and satellite and HD radio. An optional Seating package includes leather seating surfaces, heated and ventilated front seats, a split-folding rear seat, a heated steering wheel with power tilt-and-telescoping, a CD player (glovebox-mounted) and additional LED interior ambient lighting. Upgrading to the CTS Luxury trim (four-cylinder or base V6) includes the above Seating package plus adaptive xenon headlights with automatic high beam control, lane-departure warning, forward collision alert, blind-spot monitoring, rear cross-traffic alert, a rearview camera and Cadillac's vibrating driver's "Safety Seat." Optional for the Luxury are 18-inch wheels, adaptive magnetic suspension dampers, a panoramic sunroof, a power rear sunshade and manual rear side shades. Both the CTS Standard and Luxury trim levels' CUE systems are upgradable to include navigation and two more speakers for the Bose sound system. The CTS Performance trim (also four-cylinder or base V6) includes all the Luxury equipment listed above. It also has automated parallel parking assist, illuminated door handles and sill plates, a head-up display, a 110-volt power outlet, tri-zone automatic climate control and heated rear seats. Options for the Performance trim are a Driver Assistance package, which includes full-speed adaptive cruise control, front and rear automatic braking (which uses radar and the car's parking sensors to detect possible low-speed collision situations and automatically applies the brakes to avert a crash) and, for unavoidable collisions, automatic collision-preparation braking with automatic seatbelt tightening. You can also get 20-way-adjustable front sport seats and a reconfigurable performance gauge cluster. 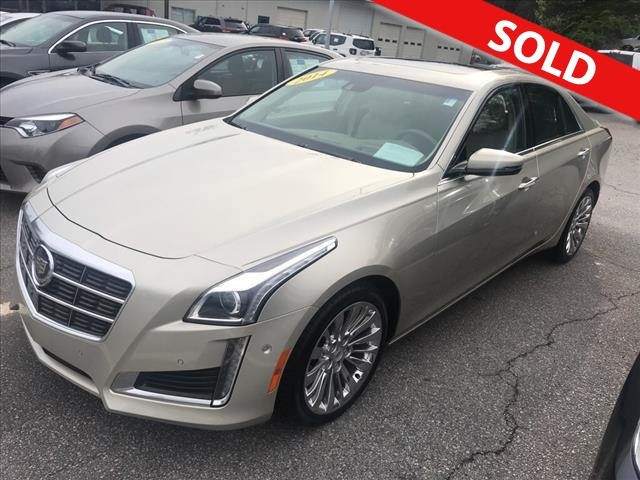 The CTS Premium trim includes all of the Performance equipment plus extended leather upholstery, the Driver Assistance package and an advanced theft deterrent package. The CTS Vsport comes exclusively with the turbocharged V6. In terms of features, it effectively matches the Performance trim level and adds a sport-tuned suspension, driver-selectable driving modes, enhanced steering, an electronic limited-slip rear differential, and specific 18-inch wheels with high-performance summer tires. The CTS Vsport Premium includes all CTS Premium and Vsport standard equipment. The sole option for the Vsport is a high-performance brake pad upgrade. A 2.0-liter turbocharged four-cylinder engine making 272 horsepower and an impressive 295 pound-feet of torque is the base engine for the 2014 Cadillac CTS on the Standard, Luxury, Performance and Premium trim levels. Available with either rear-wheel drive (RWD) or all-wheel drive (AWD), the four-cylinder is hooked up to a six-speed automatic transmission. Optional on the CTS Luxury, Performance and Premium trims is a 3.6-liter V6 good for 321 hp and 275 lb-ft of torque. With RWD, the engine comes with an eight-speed automatic transmission. The V6 AWD still gets the six-speed. Topping the CTS powertrain choices is the Vsport-specific turbocharged 3.6-liter V6. It cranks out 420 hp and 430 lb-ft of torque. Rear-wheel drive with the eight-speed automatic is the sole drivetrain configuration. As of this writing, the EPA has released fuel economy data for three configurations of the 2014 Cadillac CTS: The four-cylinder CTS rates 23 mpg combined (20 city/30 highway) with rear-drive and 22 combined (19 city/28 highway) with AWD. The V6 AWD model rates 21 combined (18 city/26 highway). In Edmunds testing of a CTS Vsport, we recorded a 4.9-second 0-60-mph result, which is a good time for this class of car with V8-like power. Standard safety features for the 2014 Cadillac CTS include antilock disc brakes, traction and stability control, active front head restraints, front-seat side airbags and full-length side curtain airbags. Also standard is OnStar (which includes automatic crash notification, on-demand roadside assistance, an emergency button, stolen vehicle locator and active intervention, and remote door unlock) and rear parking sensors. In Edmunds testing of a CTS Vsport with the optional performance brake pads, we recorded an impressive 108-foot stop from 60 mph. That is excellent for this class of sedan with summer-rated tires. Optional safety equipment is impressive and includes Cadillac's vibrating Safety Alert seat, lane-departure warning and forward collision alert, blind-spot monitoring, rear cross-traffic alert, a rearview camera, a front and rear automatic braking system (which uses the car's radar and parking sensors to identify potential low-speed collision situations and applies the brakes if the driver doesn't react quickly enough), and automatic collision-preparation braking (for collisions the car deems unavoidable) with automatic seatbelt tightening. In government crash tests, the 2014 CTS received the best possible rating of five stars in the overall, frontal and side crash categories for all seating positions. The interior of the 2014 Cadillac CTS follows the trend set first by the full-size XTS. It's a sophisticated and luxurious design rendered in rich and authentic materials assembled with a high level of craftsmanship blended with technology. Leather, wood, anodized aluminum, piano-black paint and carbon fiber are all the genuine articles. As such, they are immediately pleasing to the eye and to the touch. On the electronics front, the CTS is in lockstep with the XTS and ATS, and that means there are some challenges. The touch-based Cadillac User Experience (CUE) infotainment system is at the cutting edge of such systems, offering myriad menus intended to complement connected smartphones and provide useful information on vehicle status, weather, stocks, fuel prices and more. However, like many centralized control systems, CUE relies on a color touchscreen with a minimum of conventional buttons and knobs. Not only is there a learning curve for owners used to more traditional controls, but response times to touch inputs can be slow, as if the system simply needs more computing power, even for simple tasks like adjusting audio volume. Cadillac is working on updates, though, and we're hopeful that later versions of the 2014 CTS will have a more evolved version of CUE. Even if the 2014 CTS's interior measurements aren't any larger according to the published specifications, the upscale environment in the new sedan is undeniably more pleasing and appropriate for the midsize luxury car class. As before, the front seat passengers enjoy the lion's share of space, and in this regard, the 2014 CTS is certainly competitive. It's in the rear seats and luggage capacity that the CTS falls slightly short of the competition. At 13.7 cubic feet, the CTS sedan's trunk is shy of the capacity in the 5 Series and E-Class. Our impressions of the 2014 Cadillac CTS are for now based on the 420-hp Vsport Premium. But from this top-dog CTS, acceleration is indeed impressive. What's more, the eight-speed automatic is adept at both silky-smooth upshifts and sports-carlike responsiveness depending on the selected mode. Through turns, there's an uncommon level of tactility here compared to most other midsize luxury sedans. The CTS is sharp, yet maintains composure and is refined and integrated in a way that a CTS has never been. Handling and braking tests showed competitive, if not class-leading, capabilities. Yet the CTS is also well suited for highway cruising, as the adaptive suspension allows the car to ride quite comfortably.